Here you will find 11+ type papers many of which have been created especially for Parents in Touch. Papers created for Parents in Touch all come with answers but please note that some of the other papers do not include answers. However, note that the format of the 11+ varies from county to county so please check with your school or local authority for the format of the test in your area. We have included some Bond papers which you will also find useful. Kent Test Familiarisation booklet. Bond books and Bond online have helped literally millions of pupils pass their 11 Plus and entrance exams. Answers are provided for the papers only. If you have a specific question, please contact Bond through their FAQ page. Don't miss our reviews of AE Publications, with excellent books to support 11+ practice through KS2. "Our Mission Learning Together strive to provide books that reflect the type of questions that are found in 11+ or 12+ examination papers and past papers throughout the UK. They have been written to help prepare children for a variety of selective examinations to grammar/private schools. Our Vision To provide high quality learning, teaching and practice materials suitable for grammar/private school selection tests. Professional memberships Learning Together is a member of the Publishers Association of Great Britain and The Educational Publishers Council Our Authors Stephen McConkey MA(Ed) B Ed (Hons) is a recently retired primary school headmaster with many years classroom experience preparing pupils for their eleven plus exams. Tom Maltman B Ed had a distinguished career in primary school education where he prepared hundreds of pupils for grammar school selection exams. Philip Kay is a private tutor, based in South East England, who has used his experience of working with pupils who are going to sit their 11 plus exams to write our Verbal Reasoning And Non-Verbal Reasoning Step by Step skills and technique books." All the books below can be ordered direct from Learning Together. This 11-plus English book provides preparation for 11 plus exams, common entrance exams and grammar school selection tests. As with all tests and exams, parents need to check with schools and/or their Local Authority to check the exam format and subjects. A good grasp and knowledge of all aspects of English are essential for all children, and especially if they are taking an English exam. The book comprises 10 tests of 50 questions each based on the requirements of the National Curriculum in English. Detachable answers and a comprehensive glossary are included. The book is easy to follow, well set out with a wide variety of texts including adverts, poems and stories. This book provides 10 tests each with 50 questions for the 11 plus exam. It covers all aspects of the National Curriculum for maths. There are two papers for each topic - number and algebra, measures, shape and space and data handling. Detachable answers are included; a practical idea which makes checking so much easier. The book develops mathematical language for future tests in Verbal Reasoning or Non-verbal Reasoning, and this is aided by the extensive and very useful glossary. This is a really valuable book, as most state schools do not prepare children for Verbal Reasoning tests. Even if they are not taking exams at 11, this will be useful preparation for the CATS tests many children take once they reach secondary school. Verbal Reasoning is problem-solving based around words and language. This book describes 18 different question types, with a description of how to tackle the question, step-by-step instructions and a good range of sample questions. The book is clear and the instructions easy to follow; the plentiful questions, divided by question type, are perfect to ensure complete understanding. Question types include those requiring your child to find words with the closest meaning or words with the nearest opposite meaning, antonyms and synonyms, to complete words using one or two letters and logic or logical deduction. Breaking codes or completing analogies are other possible question types. It is well worth your child studying this book before moving on to test papers. This is Book 1 in a set of 5 graduated books and it introduces synonyms, antonyms, letter series and other 11+ topics. There are 5 tests each with 85 questions and detachable answers are included. Working through the questions in the security and comfort of their own home will reassure children, as well as giving parents the opportunity to talk through questions and any problem areas. Follow on with Preparation for 11+ and 12+ Tests: book 2 - Verbal Reasoning (Includes codes, series and reading information); Preparation for 11+ and 12+ Tests: book 3 - Verbal Reasoning (Includes word connections, add letter to make 4 words) and Preparation for 11+ and 12+ Tests: book 4 - Verbal Reasoning . (Includes logical deduction, number series and letter series). The tests are consecutively numbered in the series, which highlights the importance of working through them in sequence, which will really give children comprehensive preparation. This book follows on from the four books listed above, and it will really stretch pupils, as it is the most challenging 11+ VR book in the series. It comprises 3 tests, each with 100 questions. The pull-out answer sheets make for easy marking. The questions are in standard "write in the answer" format and are a useful aid in preparing children for their 11+ exams. They offer practice questions similar to those that have been used in many areas such as Kent, London, Bucks or by the SW Herts consortium. They can also be used in preparing children for grammar school, independent and private school selection tests or for common entrance examinations in many areas of the country. Non Verbal Reasoning is not generally taught in primary schools, we again we have a really valuable book to help pupils with 11+ and 12+ selection tests, Common Entrance and CEM tests. This Step by Step Guide explains the skills and techniques necessary to tackle Non-Verbal Reasoning questions, and covers 18 different 11+ Non-Verbal Reasoning question types. Worked examples with clear explanations ensure children have a clear uderstanding before they tackle the sample questions. Many LAs and independent schools use non-verbal reasoning tests. These involves the child thinking about pictures and diagrams, and solving problems based on these items. They may include topics such as reflection of shapes, shapes hidden in other shapes and also make demands on the child's mathematical capabilities; they do not demand as much understanding of written language as VR. This invaluable pack contains 8 practice papers with detailed answers and explanations for 11 Plus, Common Entrance and for children working at greater depth. The RSL series has been highly acclaimed for its realistic, challenging approach to exam practice. What really sets this series apart is the in-depth answers which are included - with the solutions and detailed advice for every question: any parent can confidently be a tutor for their own children. The comprehension texts are chosen for interest and variety - I am impressed with the range which has something to appeal to everyone. As children's knowledge and confidence increases, they will benefit from the increasing difficulty level of the papers, from standard (ISEB level) to challenging. Each of the 8 papers has its own answers and guidance - there are 90 A4 pages. Exams at 11+ take many different formats - it's good for children to experience different formats (as they may do if they take more than one entrance exam) so the 4 structures in tis pask are really useful. Answer sheets explain the lessons to learn from each question with sample solutions, often with alternatives, for all questions. Robert Lomax is a highly experienced professional tutor and his hands-on experience is very much to the fore in his exceptionally good packs. Visit the RSL website for more information. Support your child's learning and give them confidence when tackling exams with this pack of practice papers with detailed answers and explanations for 11+ and Common Entrance exams. It is the depth to which these papers go in providing comprehensive answers and guidance that is really impressive - parents will find it enormously beneficial to spend time going through the answers with their children. Detailed advice on techniques to use in exams are very valuable, especially for pupils whose schools do not prepare them for 11+/CE. The questions are interesting and varied, making good use of topics that will excite children's interest, and they reflect all the different types of question that children could experience. The papers build in difficulty, from standard (ISEB level) to advanced level, giving a useful progression. The quality of writing is excellent, with both questions and answers being clear and unambiguous. With 6 papers, 2 at each level, each with its own answers and guidance, in total there are almost 180 pages. The tests are specifically designed for independent school entrance tests and the variety in question types will mean children are well prepared. Another excellent set. Visit the RSL website for more information. Test The CEM Test is the test set by Durham University - remember, it's vital that you check with your child's school so you know which form of test will be taken. Little and often - children can revise in bite-sized chunks with these timed tests. There are over thirty 10-Minute Tests, each covering a mixture of topics and skills so children get accustomed to moving quickly and confidently between question types. Step-by-step answers with clarification are included in a pull-out booklet. There are also fun puzzle pages throughout to challenge children’s Verbal Reasoning skills in a more relaxed style - these are a nice break from the formal tests. A progress chart at the back of the book enables you and your child to track learning. With so many questions, all the books in this series offer really good value. Non-verbal reasoning covers a huge range of question types and CGP, as you would expect, have managed to cover the range very effectively, with a good mix in each test. Fun puzzle pages are found at regular intervals - try these as a family! The pull-out answer booklet includes useful explanations to the answers. I found the glossary very helpful, with its explanation of terms such as rotation and reflection. Little and often is by far the best way to revise, so these books are perfect. Parents are, naturally, keen to get children into their school of choice, but overburdening children never helps. 10 minutes a day over a sustained period of time will really pay dividends. Non-verbal reasoning is especially important to practise at home, as the majority of schools will not cover this form of testing. As is obvious from the title, these are simply tests - if you want revision books, then look at others in the excellent CGP range, such as 11+ Non-Verbal Reasoning Study Book and Parents' Guide for the CEM Test . If children are going to sit the 11+ selection tests, it is important that parents start to prepare them early, especially as many schools will not be teaching the specific skills needed for the test. This book, which is ideal for children in Year 5, provides bite-sized practice tests which can easily be slotted in at the end of the school day, even with other commitments; the 10 minute format means children won't feel overly pressured but when done on a regular basis, really builds up valuable learning. They include typical question types used in CEM 11+ testing, helping to build skills and confidence for exam success; practice is given in comprehension, cloze exercises, grammar, spelling and vocabulary. The range of mixed tests which are included are good exam preparation. Additionally, this series comes with puzzle sections to reinforce skills and to bring in an element of fun which children will appreciate. There is also a progress chart to encourage and track improvement; answers are in a pull-out central section. Bond is the number one provider of 11+ practice, helping millions of children pass selective entrance exams. A cloze test is a test consisting of a portion of text with certain words removed, where the pupil is asked to replace the missing words. This book contains 60 tests focused on building cloze skills in preparation for the CEM 11+ test. There are very few books available which focus on just this type of test, so this will be very useful. The tests are times, so the tips for improving time management will be very useful; it's also good to give children plenty of practice of this type of test, as familiarity will help them speed up - 60 tests gives plenty. A complete set of answers is included, along with a score sheet to track results over multiple attempts - children will be able to see their progress. Guidance for parents is also included. There is a good range of different types of text, and the tests are also useful for extending vocabulary. This will be very useful for children preparing for 11+ and Common Entrance, as they will need to be working at a higher level than is generally required in Year 6. The more practice children have, the better and this book allows them to practise answering challenging comprehension questions under timed conditions. The timed element is important and children need to get used to this. Potential candidates can build skills and confidence in the areas of the test which pupils often find most difficult. This book contains 20 tests and there is a good mix of fiction, non-fiction and poetry; the questions are multi-choice. The book gives children preparing for 11+ and CE plenty of practise in answering challenging vocabulary questions under timed conditions - it is important that children get experience of timed conditions, especially as the exam gets closer. The book will help skills and confidence in the areas of the test pupils often find most difficult. This book contains 32 tests focused on building vocabulary skills (synonyms, antonyms and associated words). The tests are relatively short, meaning that it is ideal for children to do just one a day. This is an excellent series of books, which focus on smaller topic range than many, thus ensuring that children have targeted practice in the areas they most need. The 11+ can be a minefield - there are many different exam formats for the exam and different criteria applied by the schools. Primary schools rarely prepare children for the test and many, even in 11+ areas, are unfamiliar with the requirements. So what parents need is a guide to the whole process - and here it is. It includes how to apply, which subjects are set, when to apply, what grammar schools are like, the tricky question of tutoring, how to appeal and preparation for secondary school. It is packed full of unique tips, exam advice and helpful advice for children who will be taking the 11+ exam; there are plenty of useful references too. It has been written by a teacher with over 20 years experience of preparing children for the 11+; his own children were successful in gaining grammar school places. A practical guide which will be welcomed by parents with its excellent coverage of the entire process. Presented in the format of the 11+ secondary school selection tests, this pack includes four authentic test papers. These Level Three papers from Trotman should be used after steps 1 and 2 to ensure your child has a comprehensive and well balanced build up to the 11+. This is a brand new selection of papers filled with hundreds of new, authentic practise questions in the same multiple choice format as the final exams. There are four papers in the pack so pupils really are getting a feel for the exact test papers. Competition for places in grammar schools is high and places are very limited schools so Practise & Pass 11+: English Practice Test Papers are an invaluable tool to give your child the head start they need. The range of questions is good, giving experience across the board, with all the key topics included. English and maths are, of course, core subjects in every primary school; not so verbal and non-verbal reasoning so it is especially important that emphasis is given to practising these at home. Included in each pack is a booklet of answers and advice for parents. These include timings and rules; a suggested test schedule; mark schemes and how to improve scores; all these are very important and parents should heed the advice to read these before their chld sits the papers. The four papers will ensure children have plenty of experience of the varied question types this subject can produce. This pack contains four maths papers, with layout exactly as they will be experienced in 11+ tests, whether for grammar or independent schools; they are all in one booklet though. There is plenty of space for working out but no boxes for marking. Useful guidance precedes each paper. The explanations for the answers will be very useful when reviewing your child's results (or refer back to the previous books in the series). As always when choosing 11+ papers for your child to practise, make sure you check the format of the papers and the subjects with your child's school (current or prospective) - they will vary from school to school. Four papers to give that all-important practice in an area not commonly taught in primary schools. It's important to use steps 1 and 2 first - discover and develop - as this builds your child's confidence before tackling the full papers. Throwing them in at the deep end by strating off with complete papers could destroy their confidence. The series has been carefully constructed to give confidence, so are best used as designed. Use the papers under test conditions, with a timer, to give your child the closest possible test experience. Used as a progressive teaching tool, this series from Trotman will provide invaluable knowledge and experience, giving your child confidence to sit tests or exams at 11. Each 10 minute test covers a mix of topics and skills and step-by-step answers and explanations are included in a pull-out booklet. There are also puzzle pages throughout to challenge children’s maths skills in a more relaxed style; these are fun to do and provide a refreshing break - but continue to develop maths skills. The questions are sufficiently challenging to give good preparation for the test, and to show whether children are working at the required level; they are certainly more difficult than those found in the SATS test so this extra experience will be really useful. The book will also be good experience for children taking Level 6 SATS. A very practical series which is ideal to use in Years 5 and 6 for building confidence. Designed to support preparation for the new CEM 11 Plus tests, this book gives practice in two key areas: the knowledge and skills gap between the 11 plus tests and the national curriculum (it is commonly known that the majority of state schools do not prepare pupils for the 11+) and the question types with which pupils taking the 11+ tests frequently struggle. The book includes 24 short tests covering numerical, verbal and non-verbal reasoning; these allow a quick assessment of areas needing additional help and allow pupils to focus on one skill at a time. With a variety of question types included, pupils can become familiar with these. The book includes a complete set of answers with explanations, helpful notes for parents and a score sheet to track scores over multiple attempts. CEM is the Centre for Evaluation and Monitoring, a research group based at the University of Durham. They produce 11+ entrance tests for schools and local authorities and many schools and regions have opted to use the CEM 11+ test instead of GL Assessment tests; for this reason; it is excellent to see that Letts have produced such a wide range of resources. If you want comprehensive coverage of the 11+ papers for your child, then this good-value book is for you. It contains complete sets of tests (8 papers) in the exact style and format of the new CEM 11 Plus tests. These papers provide familiarisation and realistic practice ahead of the tests to build confidence and ensure success. This book contains all the tests from Book 1 and Book 2 (reviewed below) in one great value edition. You can re-use as often as you like – download additional answer sheets from the website free of charge http://www.collins.co.uk/page/letts11plus. My only negative comment is that I feel a book of this size could be daunting for pupils; I would prefer to see a bundle of individual test papers. Alternatively, buy the two separate books reviewed below. Also available 11+ Practice Test Papers Book 2 for the CEM tests (Letts 11+ Success) Each book includes four complete sets of tests (eight papers); each consists of an English and a maths and non verbal reasoning paper. The tests are created in partnership with 11 Plus Tutoring Academy, who include guidance for parents, to give experience answering CEM style questions under timed conditions - however familiar pupils are with the format, the pressure of time can offer a challenge so it is essential that timed tests are experienced. An answer sheet for each test and a complete set of answers with explanations is included - the explanations are well worth working through with your child. See sample papers and find the free audio download on the Letts website. On the whole, the range of questions is excellent and challlenging; good experience working towards the 11+ and ideal for giving pupils experience of the exact look of the papers. This, and the three books below, are for pupils preparing for the 11+ as set by GL Assessment, who provide tests for amy grammar and independent schools. Always make sure which tests your child will be taking, as this varies school by school, region by region and year by year. Make sure you get the right book - the GL books only tell you inside the front cover that they are for GL Assessment. This title contains four test papers in the exact style and format used in the 11+. These papers are intended to provide familiarisation and realistic practice ahead of the tests to build confidence and ensure success. Each paper starts with clear instructions on completing the test - go through these with your child, making sure they understand fully what is expected. The questions are designed to be answered on the multi-choice answer grids, which are found on perforated pages at the end of the book. Four Verbal Reasoning test papers in the style and format of the GL Assessment 11 Plus tests used by selective state schools in England. These papers are intended to provide familiarisation and realistic practice ahead of the tests to build confidence and ensure success. VR and non VR are particularly important areas to reinforce at home as they are not tuaght as such in state schools; practise is key with these areas of learning. There is a definite skill in working out the answer, then translating that answer onto the answer grid. The more children practise and become familiar with this concept, the better able they will be to cope with the 11+, so this format is invaluable to ensure meximum success. I like the fact the books include several pages for notes; adults and children can use these to jot down thoughts, problems and anything they want to refer back to - much better than scraps of paper! Here are four complete Maths test papers providing invaluable practice for the 11 Plus tests (GL Assessment), including notes and information for parents. As parents, make the most of the additional features that accompany these tests. Notes and information for parents are included so you get the best from using the tests with your child. Of particular value are the explanations for all answers which improve understanding - if your child gets an answer wrong, they can learn from this by using the clear and practical explanation; a huge confidence boost when next facing a similar question. With all the same excellent features of the rest of the range, here we have four non VR papers, giving vital experience in an area where practise really does pay dividends. You can download additional multiple-choice answer grids from the web site free of charge, so that you can reuse the papers as often as you need - but remember to be guided by your child and ensure that practice never becomes a chore. All these books are new editions, so completely up-to-date with current formats - and the papers look just like the test paper children will encounter on the 11+ day, so they are really valuable to give confidence and familiarity. An excellent and comprehensive series. Children benefit enormously from familiarity with question papers. That is particularly true for VR and NVR which are not normally taught in primary schools. The multiple choice format is also unfamiliar and it is hugely beneficial for children to become familiar with this too. The book contains four VR test papers in the style and format of the GL Assessment 11 Plus tests used by selective state schools in England. Useful additional features are the notes and information for parents and they will find the explanations for all answers really helpful so they can guide their child. You can download additional multiple-choice answer grids from the web site free of charge, so that you can reuse the papers as often as you need! An excellent all-round package. Faced with a page of non-verbal reasoning questions, a child could well feel confused! These are very specific question types and the technique is rarely taught in schools. There are plenty of practice papers around but this excellent book looks in detail at how to tackle the questions. The book is designed for use by children but contains a wealth of information for parents which enables them to support their child. The book starts and finishes with plenty of practical guidance and is packed with worked examples for each question type. Each key type is explained and these are followed by a good range of practice questions to check progress in each section. The fact that non VR is not generally taught makes practise and familiarisation essential if children are to tackle the papers with confidence so make good use of this excellent guide with its clear logical advice and guidance n a wide variety of question types. Extra practice in VR and Non VR is always really important in the build-up to the 11+ - many schools do not teach these subjects, so children need plenty of practice and familiarisation. This book covers the core question types through a set of 14 papers, each with 80 questions; ideally, these should be tackled in 45 minutes to replicate exam conditions. Set out in exam format, children can write the answers straight into the book and there is space for the marker to put in the result - answers are included in a pull-out section. "Bond is the number one series for 11 plus practice, with over 45 years of experience. Written by expert authors Bond Assessment Papers offer continuous comprehensive support for all 11 plus subjects from ages 5 to 13. Tried and trusted, Bond has helped millions of children achieve 11 plus success." This background means parents and teachers can rely on Bond papers to fulfil the needs of students preparing for the 11+. This set of test papers helps develop non-verbal reasoning problem-solving skills, encouraging thinking skills and providing preparation for Common Entrance and 11+ exams. As with all 11+ and similar tests and exams, check with your child's school (current or prospective) to confirm the actual format and subjects, as there are wide variations. However, whatever the variations, practice always helps and familiarity with a range of formats will stand children in good stead. Non VR is a prime example of a subject which repays lots and lots of practice - the format will not be familiar from school and can look quite puzzling iitially. Howevr, as children work through papers, they will soon become familiar with the different question types and tackle questions with confidence - with 14 papers, each with 60 questions, this book offers an excellent number of questions. Example questions precede each section, so children can understand the question type before tackling the questions. Answers are included. Additional maths practice for 11+ is also importamt, as the questions can go beyond the level taught in Year 6. This book contains 24 papers (fantastic value!) with topic-based practice questions for the 11+ exam. They have been written to cover the core 11+ question types your child will experience in their actual exam, building the skills and confidence for exam success. With its excellent range of questions, the Bond series will prove invaluable for 11+ preparation, ensuring children are confident with all question types and giving the opportunity to pick up on any areas of weakness. As with other books in the series, tutorial links are indicated alongside the questions - these refer to the relevant section in the How to Do 11+... series from Bond, thus tying the books together and meaning they work perfectly alongside each other. It's a well thought-out process which is the result of many years of experience. These 10 papers have been written to cover the core 11+ question types your child will experience in their actual exam, building the skills and confidence for exam success. These papers all fit in neatly into a progression of work provided by Bond papers - it starts with general skills practice, moves on to up to speed practice and then onto these papers. They are followed by 10 minute tests, stretch practice and then test papers in the exam format. Bond provide a truly comprehensive coverage, giving parents the reassurance that they are offering a structured scheme to help their child through the 11+; the papers are also valuable for CE preparation. The list of Key Words at the start of the book is extremely useful in explaining the terminology used. These papers have been specifically written to cover the types of questions your child will experience in their CEM (Durham University) exam, building the skills and confidence for exam success in the most demanding 11+ exams. Again, I reiterate that you should always check the format of the exam your child will be sitting. The questions are graded and carefully chosen to give a wide range of question types. Each book includes a motivating progress chart to encourage children to persevere. A simple guide is included in each book, which gives practical tips and helps improve exam skills. The CEM paper combines English and verbal literacy, so practise in this format is really valuable, ensuring pupils sit the papers with confidence. Along with the book above, this provide pupils wth a comprehensive set of papers to prepare for the CEM (Durham University) papers. There are 6 papers in tbis book, set out specifically in the CEM style which combines maths and non VR papers as one test and cover the types of questions your child will experience in their CEM (Durham University) exam, building the skills and confidence for exam success in the most demanding 11+ exams. There are answers included and room on the papers for marking so children can readily see their progress. All together, this is an excellent and comprehensive set of papers. This is an excellent series of books, allowing your child to progress at their own pace, building on the firm foundation which comes from working through the Discover and Develop levels, before going on to put theory into practice with Step 3, timed full length tests. Children often need extra practice for the 11+, as the questions may well be more challenging than those tackled in school. THat's where these books come in - introducing children to 11+ maths exam questions and tests so they can get the basics right first. With expert coaching and guidance to help children, and help adults help their child, Discover Maths explains in simple understandable language how to tackle maths exam questions correctly. Having learnt the principles, there are plenty of questions in multiple choice format to test understanding. Practice is especially important with multi-choice questions as this is a very specific format and can be confusing if unfamiliar - so give your child the best chance with this comprehensive and easy to use book. Extra practice for the 11+ is always valuable, whether or not your child's school prepares your child for these tests. This comprehensive range from Trotman takes a progressive approach, with Discover and Develop titles complemented by a book of test papers for each subject. By working systematically through these, you can be sure you have given your child the best preparation you can. Designed for those who have completed the Discover level of the Practise & Pass 11+ series, Develop Maths gives children a more advanced grounding in 11+ maths exam questions and tests once they have mastered the basics. Boasting the same expert coaching and guidance for both you and your child as the Discover level, Develop Maths clearly explains how to tackle maths exam questions correctly and is filled with hundreds of brand new, authentic practice questions. Note that the questions in this book are in multiple choice format - check with your preferred schools/local authority as tests vary from one to another. The book is divided into 15 lessons, each one focussing on a specific type of question; an introductory explanation is followed by graded questions. The questions are varied and original, carefully selected to give plenty of practice and thuis instil confidence. Discover English is for complete beginners to the prospect of learning 11+ techniques, introducing children to the style of the tests ; remember though, that tests vary from one region to another. The important point is to get as much practise as possible, thus ensuring familiarity with all question types. English exam questions and tests so they can get the basics right first. Discover English clearly explains how to tackle English exam questions correctly, with 'lessons' in the main tpic areas including spelling, punctuation, grammar and sentence structure. There are hundreds of brand new, authentic practice questions so parents can assess their child's understanding and see whether there are any gaps. Each set of questions is relatively short, allowing bite-sized revision without over-burdening your child; of course, you could combine several exercises, especially closer to the exam. The questions are in a multiple choice format used in many 11+ tests - it is invaluable to gain experience of the format, which can be a stumbling block if children have not encountered it in school. The questions are appropriate and each section builds on the learning of the previous one, allowing the parent to consolidate their child's learning. All the books in the series include answers - but more than that, they include excellent suggestions for improving the child's answers. This book develops the theme of the first book, building on the work already done in order to ensure children are thoroughly prepared. Each set of questions focuses on the lesson being covered, with multi-choice answer sheets included. As before, it is the coaching provided on each question type that is especially valuable, giving children confidence that they understand so they can then apply the technique through the questions, This is excellent for building up to the test but for valuable practice closer to the time, your child really needs to work through the actual test papers found in the third book in each series. The book will also help reinforce skills for SATS tests (especially those taking the tests at Level 6) and for Common Entrance exams. "Peter Williams is a teacher and tutor with 13 years experience coaching 7-16 year olds, both in schools and privately. In order to meet demand from parents he set up his own private tutoring company 5 years ago. Peter specialises in tutoring for the 11+ exam and created all the questions for the Practise & Pass series." Discover Non-Verbal Reasoning clearly explains how to tackle non-verbal reasoning exam questions correctly and is filled with hundreds of brand new, authentic practice questions in multiple choice format. Each book in this series follows the same format - Frequently asked questions for adults is the first and this provides a valuable introduction. The books are then divided into a series of succinct 'lessons' which take a single topic and explains how to answer the questions, along wih helpful hints. This is followed by graded pages of questions with answer sheets; the How did you do section gives the answers and assesses the students level. Practical and easy to use, this series of books is a good way to cover all the essentials in a consistent and clear fashion. This (Develop) is the second stage of the series of 11+ books by Peter Williams. Many schools do not specifically teach VR and Non VR skills so plenty of practise in these areas is essential - for this reason alone, it's great to see this series. But this is not just another set of papers - the important thing here is the step-by-step coaching which explains the skills needed to answer these questions; very important, given that these are not generally taught. There are hundreds of questions in this book, which (like all in the series) is excellent value. Verbal and non-verbal reasoning skills aren't just useful for the 11+ though - they are an excellent way to develop thinking skills which will stand children in good stead for all aspects of learning. Discover Verbal Reasoning introduces children to 11+ verbal reasoning exam questions - a question type they may well not have previously experienced - so they can get the basics right first. Boasting expert coaching and guidance for both you and your child, Discover Verbal Reasoning clearly explains how to tackle verbal reasoning exam questions correctly. There are hundreds of brand new, authentic practice questions, all designed to fit in with current exam styles, in multiple choice format. By working through this book before advancing to the Develop book, children will receive a thorough grounding, giving them the confidence to tackle more advanced questions as they mature. Clear layout makes the books easy to use and children will quickly learn what is expected. Before this stage, children will rarely have worked to a tight time schedule - their fisrt experience may be with SATS tests but the 11+ tests will precede these. So often we are asked by parents how they can help their child to work more quickly. One key answer to this is practise, practise and more practise. The more familiar children are with the many types of questions there are, the more confident they will be. So, the 100s of questions in this book are excellent for building confidence. Peter Williams is an experienced tutor who specialises in 11+ preparation - that knowledge shines through in this excellent series. A highly recommended series, easy to follow and covers all the necessary skills. Each of the three books includes 30 stimulating numerical and mathematical reasoning challenges. These are suitable for children at the top end of KS2 - those working for 11+ and CE exams, and they also provide sufficient challenge for those working towards exams at 13+. But don't let these books be restricted to working for exams - encourage children to truly enjoy the challenges of maths for its own sake, and gain the satisfacyion that comes from working out hard challenges. In fact, there are effectively many more questions than 30, as almost every one has several parts. An excellent series for those who want a challange and to develop mathematical skills. What really makes these books stand out, to my mind, is the attention to detail given in the answers. The questions are much more thought-provoking than those generally encountered in the KS2 classroom, so children (and the parents helping them) will need these explanations to reassure them they are working on the right lines (if they got the answer right) and to explain to them where they went wrong (if they didn't get the answer). To get the full benefit, adults really need to work through the answers with children - or at least ensure children do study the answers. A good range of topics are covered and the books are well laid out with plenty of space for working out and answers. "The 11+ Super Selective MATHS series has been written especially for children who seek ‘more than ordinary’ mathematical challenges. Filled with questions designed to stimulate thinking rather than simply elicit learned responses, this series provides the challenge that able pupils seek." As such, the questions are not restricted to any one exam format, but aim to develop and encourage mathematical skills so that pupils can face any type of question with confidence - a far more healthy approach than 'coaching' for a specific exam styles - an approach which can show up problems in future years. "Attractively designed and with ample space inside for pupils to express their working, this series will lead pupils to discover the fun, beauty and elegance of Mathematics!" Non Verbal reasoning is a key part of many selection tests; additionally, it is a valuable skill which helps develop thinking abilities. Generally, it is not covered in school, which makes books like this essential to help children prepare for 11+ and similar tests. This covers Identifying shapes and patterns; Missing shapes and patterns; Rotating shapes/patterns; and Codes and logic. It's not just a series of tests - each type of question is clearly explained with a series of worked examples to develop understanding; there are also useful hints and practical activities to enhance understanding. Answers are included and these are detailed. Familiarity is key to getting these questions right and this book provides both instruction and practice - excellent. Verbal Reasoning actually includes many of the topics routinely taught in school, just under another name, so the exercises in this book will benefit everyone, not just 11+ students. Topics include Alphabet and word patterns; Vocabulary; Spelling; Mathematical questions and Problem solving. As with the NVR book, there are explanations for each type of question, enabling children to tackle the questions with confidence; for those taking 11+ and similar exams it ensures familiarity. The hints are useful and easy to memorise; parents will appreciate the detail in the answers which will enable them to help children if their answer is incorrect. Clear and easy to follow with well thought out questions. This new series from CGP is for the CEM - Durham University - test, which is being used by an increasing number of schools around the country. Check with your school which tests they use. This title covers a wide range of CEM-style topics to provide students with the most effective preparation possible. There are step-by-step methods for answering questions quickly and accurately, plus round-up questions at the end of each topic (with answers). Usefully, and unusually for this type of book, there is an extensive index. THere is also a useful glossary. A pull-out Benchmark Test is included to help identify the level children are working at. The Parents' Guide is a detailed pull-out which is packed with useful advice on all steps of the 11+ process. Altogether, an extremely comprehensive book. Although we obviously do not want to pressurise our children too much, a slow steady build up to any test or exam is useful so that confidence is built up along with familiarity with the types of questions that can be expected. This book which is ideal for children in Years 4 and 5 gives just that basis. The first section is focused on specific topics - number, data handling, shape and space, and units and measures - to develop understanding and confidence. This is followed by some mixed problems and Assessment Tests that help to improve speed and accuracy across a wide range of questions. Fully explained answers to every question are included in a pull-out section, so it's easy to check children's progress and correct any mistakes. It is the explanations that are particularly useful, as these enable parents to see where mistakes have occurred and explain how to put things right. This has all the same features as the preceding book so children are enabled to make a smooth progression to the level of work that will be expected in the actual test. The progress chart gives parents a good idea of the level at which their child is working - there is also a link to download mark sheets. The topic by topic presentation is ideal for reinforcing learning and building confidence before tackling the assessment papers. In this title, the first section is focused on specific topics - spelling and grammar, word meanings, completing passages and comprehension - to develop understanding and confidence. The comprehension section is especially good as it encourages children to think in many different ways. The Assessment Tests help to improve speed and accuracy across a wide range of questions. Fully explained answers to every question are included in a pull-out section, so it's easy to check children's progress and correct any mistakes. There is a good mix of questions at different levels, allowing a gradual building of confidence and the book is clear and easy to follow. Spelling/grammar, woed meanings, completing passages - these are topics that all children need to know and understand so this book has a much wider use than just 11+. Useful hints are succinct and easy to remember adding value to the book. There are plenty of comprehesion tests included, both factual and fiction, giving a good range of experience of different questions..Assessment tests, progress charts and a glossary enhance the book. The book includes 8 assessment tests with a pull-out answer booklet. Practical and easy to use - and good value, of course. Many schools do not include VR and non VR in the curriculum so extra work on these topics, and particularly VR, is very useful - and an early start really does pay dividends. Non VR really is an area where familiarity with the question style is a huge benefit. The book starts with sections on spotting patterns and these take many different forms which gives a good foundation. A short section on shapes is followed by 8 assessment tests which have an accompanying pull-out answer booklet - this includes answers to the first sections. A clear and understandable guide to a tricky subject. I was delighted to see the CGP have produced a range of books for the 11+. Their books are excellent value and always fit the curriculum perfectly. This book contains a wide selection of Non-Verbal Reasoning practice questions (plus answers). As many schools do not specifically prepare children for the 11+, the VR and Non VR books are especially useful for parents supporting their children at home. The book looks at the various types of question that may be encountered, with examples to try. This is followed by five Assessment Tests to help to improve speed, familiarity and accuracy. These can be answered in the standard format, straight into the book, or (very usefully) using a multiple choice answer paper which can be downloaded from their website free of charge. A pull-out section contains the answers plus (very helpfully!) explanations. There are so many elements to non VR tests that children need all the examples they can to practise. This practical guide covers the different questions that may be encountered and is excellent used alongside the Practice Book. It contains step-by-step methods for answering questions quickly and accurately, plus round-up questions at the end of each topic (with answers). Wondering what level your child is at? A pull-out Benchmark Test is included to help identify the correct level for your child. CGP produce a series of books for younger children too. There is also a pull-out Parents' Guide packed with advice for helping children prepare effectively for the test. Not all 11+ authorities have English as part of the selection test, but where they do, this is an excellent selection of resources; it is also valuable to help preparation for other selective exams and for SATS revision, especially Level 6. It includes a huge range of English practice questions, The answers contain explanations which are extremely helpful. The first section focuses on specific topics - grammar, punctuation, spelling, writing and word types to develop understanding in manageable sections. These all include practice questions (answers in the pull-out).This is followed by Assessment Tests including spelling, comprehension, punctuation and grammar to help to improve confidence, speed and accuracy across a wide range of questions. Fully explained answers to every question are included in a pull-out section. For any parent who wants to help their child with English this is a clear, easy to read guide. It contains step-by-step methods for answering questions quickly and accurately, plus round-up questions at the end of each topic (with answers). It's an excellent revision guide to use at any point during Year 6, with each topic clearly explained. A The pull-out guide includes a Benchmark Test to help identify the level that children are working at. The Parents' Guide is packed with advice for helping children prepare effectively for the test, including information about the tests in different areas. These can vary year-by-year, so always take advice from your child's school as well. This book contains a huge range of Verbal Reasoning practice questions (with detailed answers) for children aged 10 to 11 - ideal for building up the skills they'll need for the 11 Plus and other selective entrance exams. The first section is focused on specific topics (the alphabet, making words, word meanings, maths and sequences, logic and coding) to develop understanding and confidence. This is followed by Assessment Tests that help to improve speed and accuracy across a variety of question types. We are often asked how to improve children's concentration and thinking skills - this book is an excellent way to do this. The book starts with a pull-out Benchmark Test is included to help identify the level that children are working at. This is really important, as children can so easily be put off at this stage if they are asked to do questions for which they are not ready This full-colour book is a clear, easy to read guide to success in Verbal Reasoning tests for the 11 Plus and other selective entrance exams. It contains step-by-step methods for answering questions quickly and accurately, plus round-up questions at the end of each topic (with answers). The Parents' Guide is packed with advice for helping children prepare effectively for the test and the end of the book includes practical tips for children. As with all the books in this series, it is practical and well thought out - using the Study Book and Practice Book for each topic will cover all the ground your child needs. This book contains a huge range of Maths practice questions plus detailed answers). As with the rest of the series, these support praparation for any selective exam, as well as Year 6 work and preparation for Year 7 (keen parents may like to use the books to give their child's learning reinforcement over the summer holiday before secondary school). The first section covers specific topics to develop understanding and confidence. This is followed by Assessment Tests that help to improve speed and accuracy across a wide range of questions - the range of questions is excellent. Fully explained answers to every question are included in a pull-out section. Making good use of colour, this is a clear and readable guide. Not just for the 11+, but as with all the other books listed here, it is useful for revision for Common Entrance and for SATS revision for those who need stretching a little. It contains step-by-step methods for answering questions quickly and accurately, plus round-up questions at the end of each topic (with answers) so parents can check understanding before their child moves on. A pull-out Benchmark Test is included to help identify the level that children are working at, and there's also a detailed Parents' Guide packed with advice for helping children prepare effectively for the test. Altogether, this series is excellent for 11+ preparation. Verbal Reasoning forms part of most 11+ exams and also some Common Entrance papers. More than that, vital skills can be developed through VR which benefit all areas of learning. It can be fun too and gives a real sense of achievement when questions are successfully answered. There are 60 activity sheets in this workbook and they cover a wide range of skills - vocabulary, mental arithmetic and general knowledge - wider than just VR. These are covered randomly through the book so children will not get bored with one type of question; they will also learn plenty of different approaches so that they will not be 'thrown' when presented with an unfamiliar format. The questions are slightly unusual so you won't have the feeling that you have seen them before. It's all about confidence building and familiarity and this book is excellent for that. All presented with touches of humour to make the work enjoyable! These two books from Lucky Gecko Tuition are excellent resources for preparing children for the 11+, and other verbal reasoning tests - and for improving concentration and developing thinking skills in all children. VR is a subject which is not commonly taught in schools, so practice and preparation are essential to ensure familiarity. There are many types of VR questions and these books are an excellent way of ensuring all the different types are covered, giving your child the confidence needed to tackle the tests. The questions are laid out in multiple choice format. This gives experience of transferring the answers to the questions to the answer sheet - not an easy skill to acquire, so this is really valuable. The authors recommend that children work through the questions in the first book at their own pace, ensuring familiarity and allowing areas of weakness to be picked up. The second book consists of timed questions, giving essential practice in making the best use of the time allocated. I highly recommend these books for essential pre-test practice and revision. The format and the 21 types used in the books and papers match the Buckinghamshire exam. They also work in partnership with an iPhone App developer, who has produced three 11+ apps , with two pending with Apple at the moment- please see www.luckygeckoapps.com for more information. They're great for the 11+, and can be really useful for any students looking to improve their mental maths and vocabulary range. Assuming no prior knowledge, this guide from GL Assessment provides you with information, guidance and advice to help you support your child through the 11+ process. GL Assessments produce the majority of 11+ papers taken in the UK, so they are ideally placed to support parents whose children are taking the test. The first part of the book explains the process and helps parents to know whether the 11+ is right for their child - always a tricky decision and one which should be taken in conjunction with the child's school. 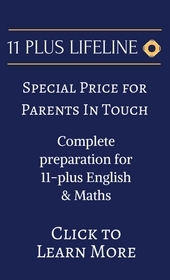 The second part helps parents to prepare their child for the 11+, with sections on preparation, techniques and much more. Usefully, the book also covers the emotional aspects of taking the test. An excellent guide which I recommend to all parents considering the 11+ for their child. Who better to provide practice questions than the people who set most of the 11+ papers? Of course, you always need to check the format of the papers in your area, but these will provide excellent practice. Giving your child essential skills and strategies for success in Non-Verbal Reasoning. This book provides step-by-step guidance on how to tackle every question type successfully, supported by practice questions, advice on test technique, tips and fun activities. I really like the fun activities, which help your child develop essential skills without it seeming a chore. All the explanations are clear and easy to follow, breaking down the questions into manageable parts. A comprehensive guide which goes far beyond merely a collection of practice papers. Giving your child essential skills and strategies for success in Verbal Reasoning, this book provides step-by-step guidance on how to tackle every question type successfully. This is supported by practice questions, advice on test technique, tips and fun activities. Many schools do not teach children VR and Non VR, so these two books provide an essential resource for familiarisation. They can also be usefully used for Common Entrance preparation and as a way to develop your child's thinking and reasoning skills - many children find these types of questions challenging yet fun. The questions will really make children think and extend their ability to learn, which will benefit them in all aspects of life and learning. There are 2 packs in the series, each containing 3 Vr and 3 non VR; one pack is multiple choice, the other is standard questions. Check with your child's school which type of paper they will be sitting. The papers are in a format commonly used for the 11+ thereby giving your child essential experience and familiarisation. The answer books are really useful - alongside the answers are suggestions on timing, how to mark the papers and valuable hints on how to tackle each type of question, ensuring you give your child the best possible help. Excellent packs from CGP, which are well worth using with your child in the run up to the tests, especially as VR and non VR are not always taught in schools. Excellent value packs.